Cycas rumphii with old and new male cones. Cycadales is an order of seed plants that includes all the extant cycads. These plants typically have a stout and woody (ligneous) trunk with a crown of large, hard and stiff, evergreen leaves. They usually have pinnate leaves. The individual plants are either all male or all female (dioecious). Cycads vary in size from having trunks only a few centimeters to several meters tall. They typically grow very slowly and live very long, with some specimens known to be as much as 1,000 years old. Because of the superficial resemblance, they are sometimes confused with and mistaken for palms or ferns, but are only distantly related to either. Cycadales are found across much of the subtropical and tropical parts of the world. They are found in South and Central America (where the greatest diversity occurs), Mexico, the Antilles, southeastern United States, Australia, Melanesia, Micronesia, Japan, China, Southeast Asia, India, Sri Lanka, Madagascar, and southern and tropical Africa, where at least 65 species occur. Some can survive in harsh semidesert climates (xerophytic), others in wet rain forest conditions, and some in both. Some can grow in sand or even on rock, some in oxygen-poor, swampy, bog-like soils rich in organic material, and some in both. Some are able to grow in full sun, some in full shade, and some in both. Some are salt tolerant (halophytes). Cycadales belong to the biological division Cycadophyta along with the fossil order Medullosales. The three extant families of cycadales are Cycadaceae, Stangeriaceae, and Zamiaceae. Though they are a minor component of the plant kingdom today, during the Jurassic period, they were extremely common. They have changed little since the Jurassic, compared to some major evolutionary changes in other plant divisions. Cycads are gymnosperms (naked seeded), meaning their unfertilized seeds are open to the air to be directly fertilized by pollination, as contrasted with angiosperms, which have enclosed seeds with more complex fertilization arrangements. Cycads have very specialized pollinators, usually a specific species of beetle. They have been reported to fix nitrogen in association with a cyanobacterium living in the roots. These blue-green algae produce a neurotoxin called BMAA that is found in the seeds of cycads. This neurotoxin may enter a human food chain as the cycad seeds may be eaten directly as a source of flour by humans or by wild or feral animals such as bats, and humans may eat these animals. It is hypothesized that this is a source of some neurological diseases in humans. Cycads have a cylindrical trunk which usually does not branch. Leaves grow directly from the trunk, and typically fall when older, leaving a crown of leaves at the top. The leaves grow in a rosette form, with new foliage emerging from the top and center of the crown. The trunk may be buried, so the leaves appear to be emerging from the ground and the plant appears to be a basal rosette. The leaves are generally large in proportion to the trunk size, and sometimes even larger than the trunk. The leaves are pinnate (in the form of bird feathers, pinnae), with a central leaf stalk from which parallel "ribs" emerge from each side of the stalk, perpendicular to it. The leaves are typically either compound (the leaf stalk has leaflets emerging from it as "ribs"), or have edges (margins) so deeply cut (incised) so as to appear compound. Some species have leaves that are bipinnate, which means the leaflets growing along the rachis each have their own subleaflets growing along a rachilla (self-similar geometry). About 306 species of living Cycadales have been described, in 10–12 genera and two or 3 families of cycads (depending on taxonomic viewpoint). The classification below is based upon a hierarchical structure based on cladistic analyses of morphological, anatomical, karyological, physiological and phytochemical data. The number of species in the clade is low compared to the number in most other plant phyla. However, paleobotanical and molecular research indicates that the diversity was greater in the history of the phylum. The disparity in molecular sequences is very high between the three main lineages of cycads, implying that genetic diversity in the clade was once high. 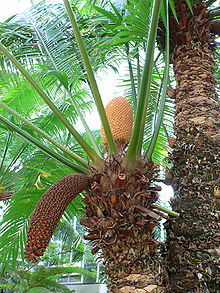 Some clearly defined cycad species can interbreed and produce fertile offspring. Bowenia. Two species in Queensland, Australia; type: B. spectabilis Hook. ex Hook. f.
Ceratozamia. 26 species in southern Mexico and Central America; type: C. mexicana Brongn. Microcycas. One species in Cuba; type: M. calocoma (Miquel) A. DC. The three families can be identified by looking at the central stalk of the leaf. Each family has at least one vein running up the leaf stalk from bottom to top (longitudinal). The Cycadaceae have only one vein in the center of the leaf stalk (central vein), but no veins on the stalklets of the leaflet (no lateral veins). The Stangeriaceae have only one central vein, but with lateral veins, also. The Zamiaceae have more than one central vein, and they are parallel to each other. These are Cycas revoluta seeds. They are very toxic. Starch-rich cycad seeds were an important part of the diet of Aboriginal people in some regions of Australia. Prior to eating them, Aboriginal people used techniques such as roasting the seeds and then soaking the kernels for many days to wash out the poison. Modern knowledge about cycads began in the 9th century with the recording by two Arab naturalists that the genus Cycas was used as a source of flour in India. Later, in the 16th century, Antonio Pigafetta, Fernão Lopes de Castanheda and Francis Drake found Cycas plants in the Moluccas, where the seeds were eaten. The first report of cycads in the New World was by Giovanni Lerio in his 1576 trip to Brazil, where he observed a plant named ayrius by the indigenous people; this species is now classified in the genus Zamia. Pigs were taken on board the Endeavour in Tahiti as a source of fresh meat and, when they were fed cycad seeds, several of them died. Throughout the 18th-19th centuries, discoveries of several species were reported by numerous naturalist researchers and discoverers traveling throughout the world. One of the most notable researchers of cycads was American botanist C.J. Chamberlain whose work is noteworthy for the quantity of data and the novelty of his approach to studying cycads. His 15 years of travel throughout Africa, the Americas and Australia to observe cycads in their natural habitat resulted in his 1919 publication of The Living Cycads which remains current in its synthesis of taxonomy, morphology and reproductive biology of cycads, most of which was obtained from his original research. His 1940s monograph on the Cycadales, was never published. The probable former range of cycads can be inferred from their global distribution. For example, the family Stangeriaceae only contains three extant species in Africa and Australia. Diverse fossils of this family have been dated to 135 mya, indicating that diversity may have been much greater before the Jurassic and late Triassic mass extinction events. However, the cycad fossil record is generally poor and little can be deduced about the effects of each mass extinction event on their diversity. Instead, correlations can be made between the number of extant gymnosperms and angiosperms. It is likely that cycad diversity was affected more by the great angiosperm radiation in the mid-Cretaceous than by extinctions. Very slow cambial growth was first used to define cycads, and because of this characteristic the group could not compete with the rapidly growing, relatively short-lived angiosperms, which now number over 250,000 species, compared to the 947 remaining gymnosperms. The cycad fossil record dates to the early Permian, 280 million years ago (mya). There is controversy over older cycad fossils that date to the late Carboniferous period, 300–325 mya. One of the first colonizers of terrestrial habitats, this clade probably diversified extensively within its first few million years, although the extent to which it radiated is unknown because relatively few fossil specimens have been found. The regions to which cycads are restricted probably indicate their former distribution in the Pangea before the supercontinents Laurasia and Gondwana separated. Recent studies have indicated the common perception of existing cycad species as living fossils is largely misplaced, with only Bowenia dating to the Cretaceous or earlier. Although the cycad lineage itself is ancient, most extant species have evolved in the last 12 million years. The family Stangeriaceae (named for Dr. William Stanger, 1811–1854), consisting of only three extant species, is thought to be of Gondwanan origin, as fossils have been found in Lower Cretaceous deposits in Argentina, dating to 70–135 mya. The family Zamiaceae is more diverse, with a fossil record extending from the middle Triassic to the Eocene (54–200 mya) in North and South America, Europe, Australia, and Antarctica, implying the family was present before the break-up of Pangea. The family Cycadaceae is thought to be an early offshoot, with fossils from Eocene deposits (38–54 mya) in Japan, China, and North America, indicating this family originated in Laurasia. Cycas is the only genus in the family and contains 99 species, the most of any cycad genus. Molecular data have recently shown Cycas species in Australasia and the east coast of Africa are recent arrivals, suggesting adaptive radiation may have occurred. The current distribution of cycads may be due to radiations from a few ancestral types sequestered on Laurasia and Gondwana, or could be explained by genetic drift following the separation of already evolved genera. Both explanations account for the strict endemism across present continental lines. Overall species diversity peaks at 17˚ 15"N and 28˚ 12"S, with a minor peak at the equator. There is therefore not a latitudinal diversity gradient towards the equator but towards the tropics. However, the peak in the northern tropics is largely due to Cycas in Asia and Zamia in the New World, whereas the peak in the southern tropics is due to Cycas again, and also to the diverse genus Encephalartos in southern and central Africa and Macrozamia in Australia. Thus, the distribution pattern of cycad species with latitude appears to be an artifact of the geographical isolation of cycad genera, and is dependent on the remaining species in each genus that did not follow the extinction pattern of their ancestors. Cycas is the only genus that has a broad geographical range and can thus be used to infer that cycads tend to live in the upper and lower tropics. This is probably because these areas have a drier climate with relatively cool winters; while cycads require some rainfall, they appear to be partly xerophytic. Encephalartos woodii is extinct in the wild, and all living specimens are clones of the type. In recent years, many cycads have been dwindling in numbers and may face risk of extinction because of theft and unscrupulous collection from their natural habitats, as well as from habitat destruction. TRAFFIC, the wildlife monitoring network are urging countries supplying the illegal trade in Cycads to implement a blanket ban on all species to prevent further wild extinctions. All cycads are in the CITES appendix appearing under the heading Plant Kingdom and under three family names, Cycadaceae, Stangeriaceae and Zamiaceae. Cycad seeds from species on APPENDIX II are not CITES regulated. APPENDIX I seeds are treated the same as the plants. In Vanuatu, where the cycad is known by the Bislama name namele, the tree has deep customary and spiritual significance. A single cycad leaf may be used as a taboo sign, while a pair of crossed cycad leaves is a peace sign and appears on the Vanuatu flag. The breaking off of fronds from a cycad leaf is used in traditional contexts as an aid to counting. Cycad leaves are used to decorate venues during festivals, marriages and other community celebrations. Cycads can be cut into pieces to make new plants, or by direct planting of the seeds. Propagation by seeds is the preferred method of growth, and two unique risks to their germination exist. One is that the seeds have no dormancy, so the embryo is biologically required to maintain growth and development, which means if the seed dries out, it dies. The second is that the emerging radicle and embryo can be very susceptible to fungal diseases in its early stages, when in unhygienic or excessively wet conditions. Thus, many cycad growers pregerminate the seeds in moist, sterile media such as vermiculite or perlite. However pregermination is not necessary, and many report success by directly planting the seeds in regular potting soil. As with many plants, a combination of well-drained soil, sunlight, water and nutrients will help it to prosper. Although, because of their hardy nature, cycads do not necessarily require the most tender or careful treatment, they can grow in almost any medium, including soilless ones. One of the most common causes of cycad death is from rotting stems and roots due to over-watering. Some insects, particularly scale insects, some weevils and chewing insects can damage cycads, though the pests are susceptible to insecticides such as the horticulture soluble oil white oil. Sometimes bacterial preparations may be used to control insect infestation on cycads. When some of the mature plants prepare for reproduction, though, the presence of weevils has been shown to help accomplish pollination. While the cycads have a reputation of slow growth, it is not always well-founded, and some actually grow quite fast, achieving reproductive maturity in 2–3 years (as with some Zamia species), while others in 15 years (as with some Cycas, Australian Macrozamia and Lepidozamia). The starch obtained from the stems of certain species is still used as food by some indigenous tribes. Tribal people also grind and soak the seeds to remove the nerve toxins that may be present, making the food source generally safe to eat, although often not all the toxin is removed. In addition, consumers of bush meat may face a health threat as the meat comes from game which may have eaten cycad seeds and carry traces of the toxin in body fat. Cycad, known as sotetsu (Jap. ソテツ, Kanji: 蘇鉄) in Japanese, was traditionally a famine food in Okinawa - a last resort to turn to for sustenance during particularly difficult times. A period of particularly devastating poverty and famine in the 1920s, caused in large part by Japanese economic policies in the island prefecture, is known as "cycad hell" or sotetsu jigoku. Cycad meal known as Eenthu in Malayalam is a common food in Kerala. Traditionally, the seeds were sliced and kept in direct sunlight or near the hearth during rainy season to promote drying. The drying process is carried out to reduce the toxin levels and as a means of preservation. The outer shell is subsequently removed and inner portion is ground into a flour. Properly dried cycad seed flour may be stored for several years without deterioration. Food items like Puttu, Eenthu kanji, Eenthu payasam etc. are made out of cycad seed powder.These food items are particularly prepared in heavy rainy seasons in Kerala. There is some indication that the regular consumption of starch derived from cycads is a factor in the development of Lytico-Bodig disease, a neurological disease with symptoms similar to those of Parkinson's disease and ALS. Lytico-Bodic and its potential connection to cycasin ingestion is one of the subjects explored in Oliver Sacks' 1997 book Island of the Colourblind. Cattle that graze in pastures containing cycads may ingest the leaves and seeds and develop the neurologic syndrome of cycad toxicosis known as zamia staggers. ^ Holtcamp, W. (2012). "The emerging science of BMAA: do cyanobacteria contribute to neurodegenerative disease?". Environmental Health Perspectives. 120 (3): a110–a116. doi:10.1289/ehp.120-a110. PMC 3295368. PMID 22382274. ^ Stevenson, D. (1992). "A formal classification of the extant cycads". Brittonia. 44 (2): 220–223. doi:10.2307/2806837. JSTOR 2806837. ^ (Hermsen et al. 2006). ^ Nagalingum, N. S.; et al. (2011). "Recent Synchronous Radiation of a Living Fossil". Science. 334 (6057): 796–799. doi:10.1126/science.1209926. PMID 22021670. ^ Hopkins, DJ; KR Johnson (December 1997). "First Record of cycad leaves from the Eocene Republic flora". Washington Geology. 25 (4): 37. ^ Kerr, George. Okinawa: The History of an Island People. Revised Edition. Boston: Tuttle Publishing, 2000. pp406-7. ^ Smits, Gregory. "Okinawa in Postwar Japanese Politics and the Economy Archived 30 May 2013 at the Wayback Machine." East-Asian-History.net. Accessed 5 December 2009. Chaw, S.-M.; Parkinson, C.L. ; Cheng, Y.; Vincent, T.M. ; Palmer, J.D. (2000). "Seed plant phylogeny inferred from all three plant genomes: Monophyly of extant gymnosperms and origin of Gnetales from conifer". Proceedings of the National Academy of Sciences. 97 (8): 4086–4091. doi:10.1073/pnas.97.8.4086. PMC 18157. PMID 10760277. Chaw, S.-M.; Walters, T.W. ; Chang, C.-C.; Hu, S.-H.; Chen, S.-H. (2005). "A phylogeny of cycads (Cycadales) inferred from chloroplast matK gene, trnK intron, and nuclear rDNA ITS region". Molecular Phylogenetics and Evolution. 37 (1): 214–234. doi:10.1016/j.ympev.2005.01.006. PMID 16182153. Chaw, S.-M.; Zharkikh, A.; Sung, H.-M.; Luu, T.-C.; Li, W.-H. (1997). "Molecular phylogeny of extant gymnosperms and seed plant evolution: Analysis of nuclear 18s rRNA sequences". Molecular Biology and Evolution. 14 (1): 56–68. doi:10.1093/oxfordjournals.molbev.a025702. PMID 9000754. Crepet, W.L. (2000). "Progress in understanding angiosperm history, success, and relationships: Darwin's abominably 'perplexing phenomenon'". Proceedings of the National Academy of Sciences. 97 (24): 12939–12941. doi:10.1073/pnas.97.24.12939. PMC 34068. PMID 11087846. Donaldson, J. (2004) "Saving ghosts? The implications of taxonomic uncertainty and shifting infrageneric concepts in the cycadales for red listing and conservation planning", In: Walters, T. & Osborne, R. (eds), Cycad Classification: Concepts and Recommendations, Wallingford, UK : CABI, ISBN 0-85199-741-4, p. 13-22. Golding, J.S. ; Hurter, P.J.H. (2003). "A Red List account of Africa's cycads and implications of considering life-history and threats". Biodiversity and Conservation. 12 (3): 507–528. doi:10.1023/A:1022472801638. Gonzàlez-Astorga, J.; Vovides, A.P. ; Ferrer, M.M. ; Iglesias, C. (2003a). "Population genetics of Dioon edule Lindl. (Zamiaceae, Cycadales): biogeographical and evolutionary implications". Botanical Journal of the Linnean Society. 80 (3): 457–467. doi:10.1046/j.1095-8312.2003.00257.x. Gonzàlez-Astorga, J.; Vovides, A.P. ; Iglesias, C. (2003b). "Morphological and geographic variation in Dioon edule Lindl. (Zamiaceae): ecological and evolutionary implications". Botanical Journal of the Linnean Society. 141 (4): 465–470. doi:10.1046/j.1095-8339.2003.00155.x. Gregory, T.J. & Chemnick, J. (2004) Hypotheses of the relationship between biogeography and speciation in Dioon (Zamiaceae). In: Walters, T. & Osborne, R. (eds), Cycad Classification: Concepts and Recommendations, Wallingford, UK : CABI, ISBN 0-85199-741-4, p. 137-148. Hermsen, E.; Taylor, E.; Taylor, T.; Stevenson, D. (2006). "Cataphylls of the middle Triassic cycad Antarcticycas schopfii and new insights into cycad evolution". American Journal of Botany. 93 (724–738): 724–38. doi:10.3732/ajb.93.5.724. PMID 21642136. Hill, C.R. (1990). "Ultrastructure of in situ fossil cycad pollen from the English Jurassic, with a description of the male cone Androstrobus balmei sp. nov". Review of Palaeobotany and Palynology. 65 (1–4): 165–193. doi:10.1016/0034-6667(90)90067-S.
Hill, K.D. (2004) "Character evolution, species recognition and classification concepts in the cycadaceae", In: Walters, T. & Osborne, R. (eds), Cycad Classification: Concepts and Recommendations, Wallingford, UK : CABI, ISBN 0-85199-741-4, p. 23-44. CABI, Oxford. Hill, K.D. ; Stevenson, D.W.; Obsorne, R. (2004). "The World List of Cycads". Botanical Review. 70 (2): 274–298. doi:10.1663/0006-8101(2004)070[0274:TWLOC]2.0.CO;2. Hopkins, DJ; Johnson, KR. "First record of cycad leaves from the Eocene Republic flora". Washington Geology. 25 (4): 37. Keppel, G.; Lee, S.W. ; Hodgskiss, P.D. (2002). "Evidence for Long Isolation Among Populations of a Pacific Cycad: Genetic Diversity and Differentiation in Cycas seemannii A.Br. (Cycadaceae)". Journal of Heredity. 93 (2): 133–139. doi:10.1093/jhered/93.2.133. Stevenson, D (1992). "A formal classification of the extant cycads". Brittonia. 44 (2): 220–223. doi:10.2307/2806837. JSTOR 2806837. Stevenson, D., K. Norstog, & P. Fawcett. 1998. Pollination biology of cycads. In: Reproductive Biology: In systematics, conservation, and economic botany. Eds. S. Owens & P. Rudall. pp. 277–294. Royal Botanic Gardens, Kew.